I honestly don't think I could ever be without a lip balm. On the rare occasion that I've walked out of the house without at least three stashed in my purse, I've felt myself going into panic mode. And the times that -- horror of horrors! -- I forget one altogether? You might as well consider the entire day a waste. But now that Clarins HydraQuench Moisture Replenishing Lip Balm has come into my life, there's absolutely no way I would ever forget to have a lip balm at the ready. This balm has been stashed in a place of honor in my purse ever since I first tried it, and here's why. MY. LIPS. FEEL. AMAZING. They're soft, they're smooth, they're totally kissable (I swear!). No flaking, no peeling, no unsightly chapping to be had. Just a hydrated, moisturized, silky soft pout. This is due to a few unbelievably important ingredients that can be found inside the small but mighty blue tube. First up, essential rose wax. A fine, protective film collected from the surface of rose petals, this works to provide moisture and soothe the lips with a protective barrier. In addition, ceramide 3 (which is identical in structure to skin lipids), repairs chapping and irritation. The Maxi Lip Complex encourages Hyaluronic acid synthesis to make lips appear fuller. And natural rice oil extract boosts skin microcirculation to help them look pinker. And my attitude? It's so much calmer ever since this balm found its way into my purse. 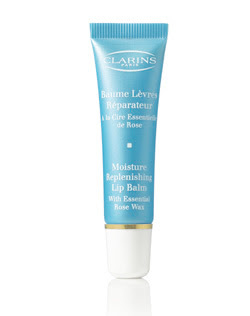 Clarins HydraQuench Moisture Replenishing Lip Balm retails for $24 at clarinsusa.com. I love it ,cant live without it !! !